Current loop devices use current on or current off to transmit binary digits. 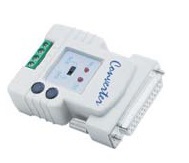 The A232-CL20/60 converter interfaces RS-232 systems to 20mA or 60mA current loop ports with open circuit voltages up to 30 V. This series of converters works without any external power supply. All the units are very easy to implement. Simply connect the appropriate interface cable and select the DCE/DTE type.